Commercial and residential roof’s can sustain significant damage from hail. With this knowledge, a great way to generate new customers is to target areas recently affected by a hail storm. In marketing, this is known as Geo-Targeting. Hail storm pay per click advertising is an effective way to take advantage of the marketplace using a supply and demand concept. Families and businesses affected by hail storms need your services quickly, and your company needs more customers. It’s a great match that can increase business while assisting people who need immediate roof repairs. Hail storm PPC is a marketing technique that roofing companies can use to jump start their business. The fastest way to grow your roofing business is to target customers who need immediate repair. Since the demand is so high, customers are more likely to take a chance on a newer company, or a relatively unknown company. By doing a good job on their roof repair, suddenly your name starts to travel through traditional word of mouth. Roofing Webmasters can help you get started with your campaign today. You might be asking yourself; Should my roofing company try hail storm PPC? If you are a relatively unknown roofing company looking for a way to build your customer base, the answer is yes. Hail storm PPC is a great opportunity to prove your value as a roofing company. Families and businesses requiring immediate roof repair are likely to remember your company forever if you do a good job. It’s a great way to jump-start your business in 2019. 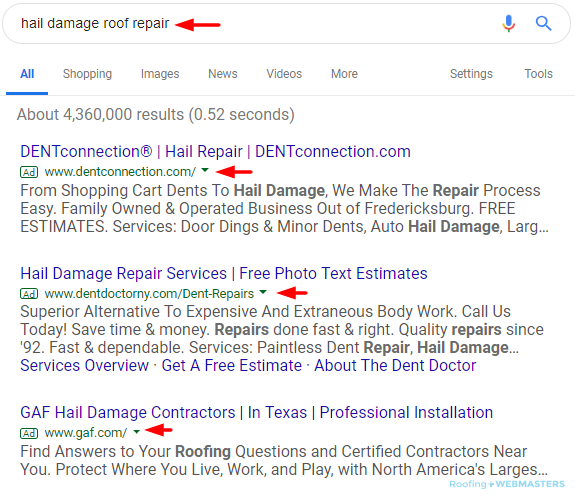 Even if your roofing company is established in the local community, hail storm pay per click advertising can still be an effective option. Since it is a technique your competition might be using, it makes sense for you to market to demographics and areas requiring immediate roof repair. Narrowing your audience is always an efficient way to improve ROI. Additionally, the more you can grow your customer base, the better of your roofing company will be in the long run. Updated on March 14, 2019 at 8:08 pm by Roofing Webmasters.